A New York Times story on 5 August 2013 described an ongoing program that has allowed the TSA to expand their activities well beyond airports, to places like sporting events, music festivals, rodeos, highways, and train terminals. The story pointed out how some groups hold that what the TSA is doing in this program is well beyond their original mandate and that their behavior may violate the constitutional rights of people in the US. TSA is not a law enforcement organization. Law enforcement organizations have significant limits when it comes to conducting a search. TSA has an exemption from these limits when it comes to searches at an airport. There is an ongoing program that allows the TSA to operate outside of airports under law enforcement supervision. The TSA employees that you see at airport screening locations typically wear the uniform that you see in the photo below. 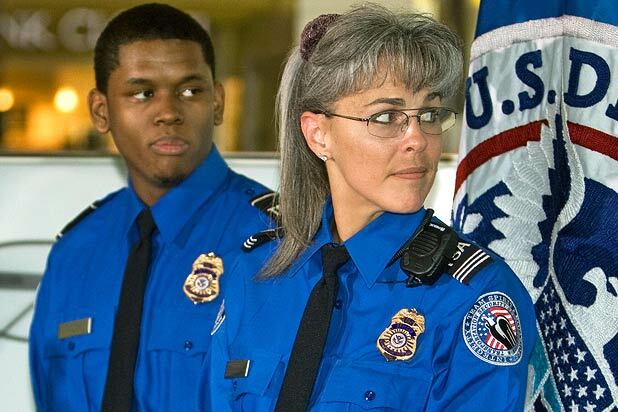 While TSA employees wear an outfit that looks like a police uniform, have badges that looks like the type used by police officers, and sometimes have titles like Transportation Security Officer, TSA is not a law enforcement agency and its employees do not have typical police powers. Typical law enforcement officers include the power to arrest someone, and the power to use force in order to execute their duties. One similarity between police officers and TSA personnel is their ability to legally search individuals or their property. However, police officers in the US have significant limitations of when such searches can be conducted, and TSA, at least at an airport, do not have these limitations. In general, law enforcement officials in the US can search an individual or that individual's property without a warrant only if that law enforcement officer has probable cause to believe that someone has committed a crime, or has a reasonable suspicion that the person has committed a crime. The TSA's ability to search passengers and their belongings at airports is based in part on a US federal court decision from 1973 which ruled that airport screenings are considered to be administrative searches because they are conducted as part of a general regulatory scheme that had the purpose of preventing the carrying of weapons or explosives aboard aircraft. The TSA VIPR (http://www.tsa.gov/about-tsa/visible-intermodal-prevention-and-response-vipr) program uses TSA assets and personnel to augment law enforcemement (including Federal Air Marshals) resources to ensure security in all modes of transportation, as well as at special high profile events. The program, which began in 2005, allows TSA to extend its ability to conduct searches beyond the airport. The New York Times article pointed out that there had been some cases in the past where the VIPR teams have conducted searches that were ineffective, for example searching passengers after they had left a train, and the Inspector General's office of the Department of Homeland Security issued a report in August 2012 that discussed numerous concerns about how these teams stay within their legal limits when it comes to searches outside of the airport. One of the fundamental concerns expressed both by the New York Times article and by some in the AirSafe.com community is that the TSA should not have the same kind of wide-ranging ability to search individuals and their belongings outside of the airport environment. This extension of TSA's authority outside of the airport parallels the New York City's "stop and frisk" program where police officers were allowed to stop, question, and search individuals without having the meet the basis law enforcement standards of reasonable suspicion or probable cause. The program, which has been in place for about a decade, has often led to arrests and confiscation of illegal weapons. However, on 12 August 2013, a US federal judge ruled that the New York City policy was unconstitutional and must be changed to adhere to constitutional limits. It is too early to tell if this decision will outlaw similar practices across the US, of it will have any effect on the TSA's VIPR program. No doubt, many who oppose the VIPR program will welcome this latest decision and will hope that it will lead to changes in how the TSA operates outside of the airport.